Elevated between 9055 ft and 11319 ft, the Ski Resort is among the 3 highest elevated Ski Resorts in Italy. The vertical drop from summit to base is 2264 ft. The average difference in altitude between base and summit of Ski Resorts in Italy is 3087 ft. Season starts on Jun 1 and ends on Nov 3 (155 days). Average season duration in Italy is 130 days. Snow coverage is usually best during June, offering an average snow depth of 72 " at summit elevation and 13 " at the base. Stilfser Joch features 200 sunny days on average per season. The average for all ski Resorts in Italy is 214 sunny days. July is the sunniest month with an average of 28 sunny days. Stilfser Joch is a mountain pass, that goes from Bormio to Prad. It features a vertical rise of 2757 meters (9045 feet) and is therefore the highest pass in Italy. Due to the masses of snow it´s usually open between May and November. It was founded in 1932 by Leo Gasperl, who opened a summer ski school up here. Especially in the 60s and 70s it was really common to come here for summer skiing. Nowadays the snow conditions in most ski resorts don´t allow summer skiing anymore but here you´ll have perfect powder and trail fun away from the typical skiing season. 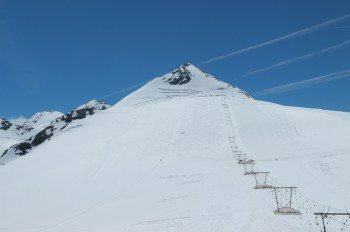 It´s the only Alpine ski resort that is open in summer only and guarantees snow fun. The tramway gives you access to the station Trincerone that boasts an altitude of 3050 meters (10000 feet) above sea level. Here you have to change trams in order to get to top station Livrio. Now take the conveyor belt to find the treasure chest of the ski resort: the so-called Geister platter lifts. Those are situated right underneath the Geisterspitze that has a drop of 3450 meters (11318 feet). For ski novices this is a great area by featuring mostly descend runs that are ideal for practicing first curves. Primarily the lower part is pretty shallow. So smart beginner skiers should definitely get out the lift earlier and ride the ski tow. Further up are the trails really inviting for carving and often a training location for many national teams. The most challenging run in the resort is the red marked Payer Agonistica. Get up to the Geisterspitze and off you go to the Payer lift. In order to avoid the steepest part, pick the Payer Turistica that almost goes parallel to this one. Additionally you should check out the ski circuit, the Valle dei Vitelli, that starts at Cristallo lift. 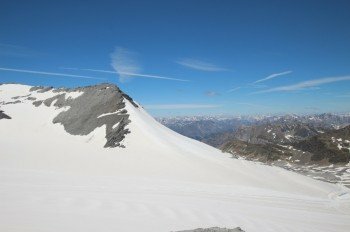 If there´s new snow you can also go off-piste, but be aware that there is a great risk of crevasses. Freestylers won´t miss out either. At the trail Payer Tursitica there is a great terrain park with features that will give an adrenaline rush to every Freestylers of all ability levels. The resort is home to three hotels that all have restaurants that cater to every palate. Right at the Livrio gondola you´ll find the eponymous hotel. The hotel´s restaurant serves Italian cuinsine and comes with a killer view. When you get out at the Trincerone top station you will see Hotel Baita Ortler and Hotel Thöni. They have fantastiic food on the menu as well and great sun decks to wind down and recharge batteries for the following hours of skiing. 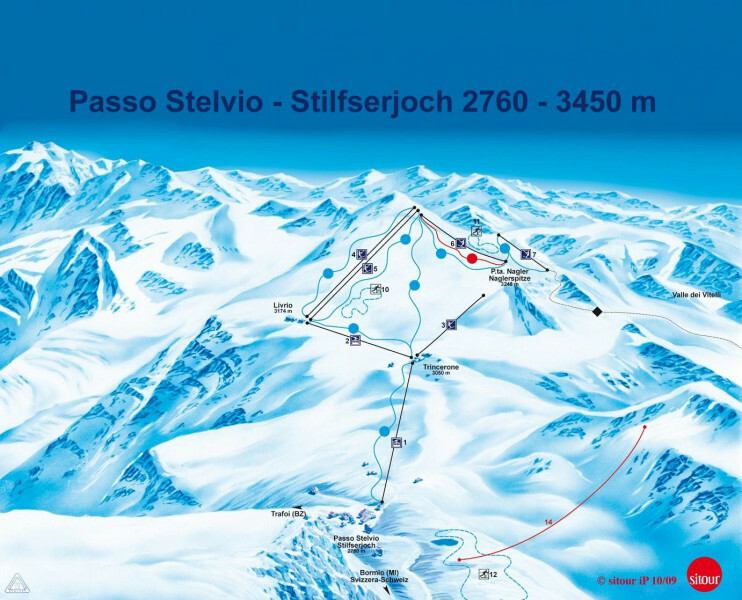 If you come to Stiflser Joch for skiing, also bring some time to explore the surrounding area. South of Passo Strlvio, the impressive Ortlermassiv begins. The magical mountain world is perfect for a hike and you can discover the beauty of the nature. Due to the fact that the pass road is pretty winding it´s actually well-known among cyclists. The Passo Stelvio is even a part of Giro d’Italia. Once a year its also host to an other cycling sport highlight: The whole road is blocked for motorized vehicles. Stilfser Joch is exclusively accessible by car. Unfortunately there´s no Public Transportation available. Coming from Munich you have to get on A 95 towards Garmisch and then continue on B23 (becomes B187 in Austria). After change on B179 with direction Nassereith and later towards Imst. Now drive towards Zams Landeck ( B171) and after follow B180/Reschen street towards Nauders. Follow Reschen street to the junction Prad. From here just follow the pass road up to Stilfser Joch.